Kate declined going down to stay on Lady Jane this weekend, possibly on account of the cold, so I feel guilty about having so much fun without her. As promised, I investigated the Castle In The Air, ably assisted by Malcolm, Duncan and Andy. It turns out that Malcolm and Pam live literally right across the road from where Lady Jane is berthed, they are friends of ours and Tracy's parents. John and Tracey are good friends who live in the same village as Kate and I. One of life's co-incidences. I was unaware of the match, but discovered Portsmouth had just lost 1-2 to arch rivals Southampton. With most people in Fareham supporting Portsmouth, as it's just down the road, the town centre was apparently 'quite rough'. The pub was isolated from all that and had an excellent live band, well two blokes with guitars actually, but they were good. As it was, it turned out to be an excellent evening. The picture you see was taken once I got back to Lady Jane at about 11.00pm. Thanks to everyone who left comments and sent e-mails with such positive feedback, questions and offers of help. Q) How skilled were you before you started this? It seems you know a bit about diesel mechanic'ing and also some basic skills like welding. Did you acquire these before or after you bought LJ? A) I have always been mechanically minded and was into motorbikes for years. At 16 I had already figured out how to strip and re-assemble my motorbike engine, with no bits left over. After school, I went on to do an HND in mechanical engineering, although I never did any engineering as I discovered computers and programming. As to the welding skills etc. I'm learning fast as I've never done anything like this! I believe basic cutting and welding is not difficult, cutting and welding well is the difficult bit. Q) Is this your full time job? No, I have a full time job with a computer software company. The switch from an office based job to manual work, much of it outdoors, is a welcome change. I usually get down to Lady Jane on the weekends, which is why my Blog is only updated during the week. I also sneak off down to Lady Jane on the occasional Wednesday. Q) How much is this costing you? A)Lady Jane cost me less than what the price of a small house by the sea. I had some cash saved up which I used, oh and I owe a little more on the house. Right now I'm controlling how much I spend by choosing the type of work I'm doing and how much I do. For example, the welding being done at present costs me, as I do not have the skill to do the type of welding that needs to be done, so I'm getting that done fairly slowly. Cleaning up, rubbing down, cutting and painting etc. is effectively free so I can do as much of that as I want. I have plenty of paint on board. There is stuff I have to buy, like the alternator and wind turbine, that I'm paying for on my cc. That spending is pretty much under control now though. Q) Where are you going to take Lady Jane? A) Kate and I have no definite plans, more the concept of taking her somewhere nice then possibly commuting between home and Lady Jane. We have good friends in Tenerife, which may be our first 'long haul' destination. I like the idea of going to Alaska and the Antarctic, I can visit friends in the US along the way. Kate seems to favor the warmer climes like the Mediterranean. In any event, we would both enjoy having friends and family staying on board with us wherever we are. Q) How much diesel does she use? A) I'm not really sure as the only 'proper' run I've done was only from Southampton to Fareham, with some time spent in the Solent waiting for the tide so it's impossible for me to tell. I would estimate she used about 40 liters (10 US Gallons) per hour, but that was at comparatively low revs. Q) What are your long term plans for Lady Jane. A) When the time is right, I'd like Kate and I to retire and we'd spend our lives sailing wherever it took our fancy. I envision us mooring up someplace nice and staying there until we got sick of the place and wanted to move on. Now, whenever we go places the biggest cost is accommodation. Living aboard Lady Jane will solve that problem, so our biggest costs would then only be food, drink, fuel and spares (not necessarily in that order). Q) Are you going to get qualified? 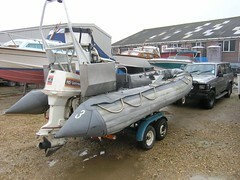 A) Yes, Kate and I have already done RYA Powerboat II and plan to move on through the courses as far as we can go. I have the number of a highly recommended instructor who will, apparently, take us through the various RYA courses on Lady Jane. Q) How fast does your new rib go? A) I've not had it in the water yet, but from the Avon web page I'm expecting it to be able to do about 40 knots, in calm water. Please feel free to ask whatever questions you want, I'll collect them and answer them when I have a good selection. 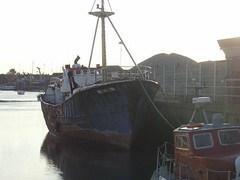 The picture you can see is Lady Jane nestled up against the wharf at the Lafarge yard in Fareham. I'm very grateful to Robin who arranged for this berth as, although its at an aggregate yard which can be a bit dusty, the location is secure and pretty idyllic. Just across from Lady Jane is a small marina, which butts up against a picturesque park while directly across the creek is a well maintained golf course. Outside the yard, and a few hundred feet down the road, is a public slipway, handily located near a wonderful looking pub, The Castle In the Air, right by the waterside. Hmm, I'll have to investigate this pub further sometime soon and report back. At low tide, Lady Jane is left sitting high and dry out of the water, the photo was taken as the tide was going out and Lady Jane was just squishing down into the mud, bear in mind she weighs 150 odd tonnes so it's a pretty good squish. Being on Lady Jane as she settles into the mud is a little disconcerting at the moment, as she sits differently to when she is afloat. I need about 5 tonnes of ballast sometime soon,to get that bow down to where it should be. I've been meaning to buy a fishing rod and some tackle to have a go at catching some dinner when I'm aboard, and the tide is right. I often see people fishing across the creek from the edge of the golf course. My problem here is, although I've been fishing in all sorts of places in the world, I don't really know much about the fish caught here. The only way to learn is to jump in at the deep end, so to speak, I suppose. Anyway, although we have not really been there long, Fareham so far seems to be a lovely place and I'm looking forward to exploring the area a little more and getting to know a few people locally. This is, after all, what the dream is all about - travelling to new places and being with friends both old and new. I've unexpectedly made it into the very excellent J-Walk Blog. I've been reading this blog for some time, when I've got the time, and am often amazed at the diversity of sites posted. I never really expected I'd have a blog, let alone one worthy of J-Walk's attentions! Suddenly my hit count has jumped from an average of around about 10-15 visitors per day to over 500. Well I'm really pleased, and hope that some of my new visitors stop by again. Oxyacetylene cutting is great fun, sorry Kate but it had to be said. It's a very satisfying feeling cutting through steel with an oxyacetylene torch, as effortless as a hot knife through butter when you do it right. I just wish someone was around when I was cutting, as I think the sparks flying from the metal being cut is an impressive sight and would have made an excellent picture. Plenty of photo opportunities in the future though, I'm sure. The temperatures involved are phenomenal, the steel is heated up to about 6000 degrees in the place it is to be cut, then a flow of pure oxygen is introduced. The steel in the oxygen flow literally burns away because of the temperature and the additional oxygen supply, which is how the actual cutting is performed. The picture shows the remains of the footing I've been working on just before I painted on a coat of Rustroy, a sort of rust proofing and primer. All it needs now is a lick of paint to seal the primer and then I'll fill the whole thing with concrete, flush with the rest of the deck. The sheer diversity of stuff I'm learning is one of the things I'm finding I really enjoy about the whole Lady Jane experience. For example I've never mixed or laid concrete, which will be my next learning experience. I don't believe it, another Tim Zim aged 43 and into boats! Like he says "There are lots of parallels". His blog is awesome: The wetass chronicles check it out. One idea is that I save the inside work for miserable days, we are not short of those here in England, and do the outside work on nice days. Right now, with the temperatures at about freezing both inside and out, I'm not really motivated to do very much at all. I'm thinking I need to just get on with these projects rather than sitting around talking about it. 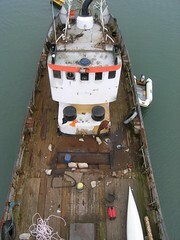 The picture shows the deck from up the mast on a pretty good day (click on it if you want to see a larger image). For an idea of the scale of Lady Jane, Baby Jane can be seen nestled up against the port side, that's on the right of the picture for the land lubbers. The white object which can just be seen in the foreground on the right is the bottom of the fourth boat I mention from time to time, a two person canoe. The red blob is my small generator. I've still got to work to pay for all this stuff, though I'd much rather be on Lady Jane. My main project at the moment is installing a new 16kva 240v ac alternator onto the donkey engine in the engine room, in place of a big old 24v generator. 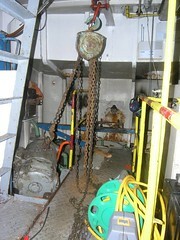 The picture shows the old 24v generator being cranked out of the engine room. If it looks heavy, it's because it is. The new alternator will provide me with mains voltage capable of running any heavy machinery or welding equipment I'll need for the forseeable future. The alternator came from Machine Mart. The new alternator is almost as big and heavy as the generator. It took some effort to get on-board, I would never have achieved that while moored in the middle of the river Itchen. For domestic appliances, such as the fridge and freezer I'm planning to run these directy off of the battery bank through an invertor, which I already have. I am expecting delivery of a wind turbine from Eclectic Energy at the end of the month. This wind turbine should provide enough power to keep the battery bank topped up. If needs be, I can always run a battery charger through the mains power off of the alternator on the donkey, or charge the battery directly from the 24v generator on the main engine. With the alternator in place I'll need to get the fuse boxes and mains wiring properly sorted out, with mains sockets installed where they will most likey be needed. Safety is of major concern here. This is why I need to sell my house. The picture you see is the stark reality that is Lady Jane's wheelhouse. What more do I need to say, except that I'm a guy who likes gadgets. I need an integrated GPS, moving map, depth sounder, fish finder, radar, internet access and auto pilot all installed in a proper console with important looking switches and dials. 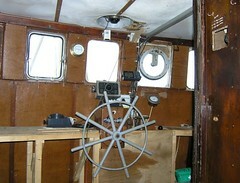 Oh and a comfy skippers seat with a stylish wooden wheel. Yup, I just bought another boat. Now I know you are thinking WHY? Is three boats not enough already? The 'new' boat, shown in the picture, is an ex military rib (a rigid inflatable boat) a 5.4m Searider from Avon, with a 115hp Johnson v4 engine. I know it's not pretty but, although about 10 years old, it is extremely functional, tough and perfect as a tender for Lady Jane. I've been on the lookout for just such a rib for some months now and this one looked in pretty good shape and the price was good. I plan to spend a while cleaning and tidying it up then getting the engine serviced, or possibly even replaced with a newish 90hp Yamaha. Once ready, this boat will replace dear old Baby Jane. The truth is Baby Jane is too small as a tender and was really only a temporary measure. I'll probably clean Baby Jane up and sell it on e-bay. The rib will also be handy for larking about in the sea, fishing, maybe diving and even the odd trip to France when the weather is good. I know Dale, the landlord of our local, has expressed an interest in going fishing with it on the occasional summers evening. Kate and I have not got a name for the rib yet, naming Baby Jane has set the bar pretty high. Suggestions are very welcome. 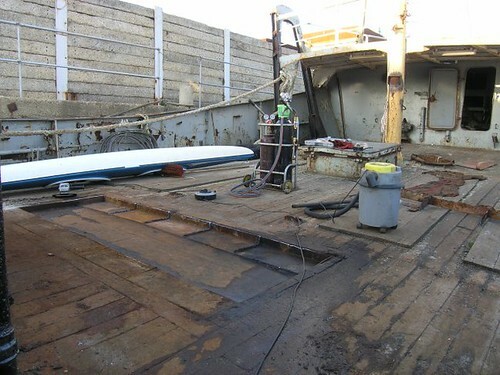 An explanation to help make sense of this blog: Lady Jane has a steel deck which is in turn mostly covered with a layer of wooden planks, each about 2 inches thick. Where machinery, such as a winch, was placed on deck it was bolted onto footings which were welded directly to the metal deck. The footings were concreted in, sealing the otherwise bare metal and preventing rust from setting in. One of the projects I 'diverted' onto, away from sorting out the accomodation, was to clean up some of the remnants of machinery which had been cut off of Lady Jane's deck by the previous owners. To be fair, it was a mess gathering rust, potentially dangerous and needed to be done. Cleaning up the remnants entails breaking out the remaining concrete, trimming the protruding metal to deck level then filling in resulting hole with concrete which would then sit flush with the wooden planking and re-seal the underlying metal deck. 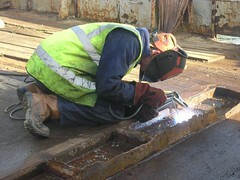 The photo of Robin welding shows some of the metal which still needs to be cut flush and the resulting hole which will be filled in with concrete. The planking on deck is also visible. Unfortunately, while breaking up the concrete I managed to punch a hole through the metal deck into the fish hold below. Now every time it rained water would flow down the slope of the deck into the metal box, clear of it's protective concrete, and leak into the fish hold despite me plugging the hole as best as possible. I've been aware the efforts of the previous owners had left holes into the fish hold in other footings needing similar cleaning up, but these were relatively easy to keep dry, unlike my new hole. I had been trying for some months to arrange getting welding done on board, I have a long list of things needing doing, but now things were a bit more urgent. After moving Lady Jane so she is berthed alongside a wharf in Fareham, just before Christmas, Robin finally started the much needed welding on Lady Jane. We had to 'borrow' power from onshore which required a quick dash to a local hardware store for yet another extension lead (don't laugh Dave). Welding one of the holes left by the previous owners needed more work than either Robin or I wanted to undertake just before Christmas, as it ment cutting and replacing the rusted plating, so that was left for later this month. The other holes are fixed though and the fish hold is again safe from the elements.